Jembjo’s Knysna Lodge & Backpackers v Knysna, Jižní Afrika: Zarezervujte nyní! All group bookings will be accommodated in the Dorm Room - subject to availability. 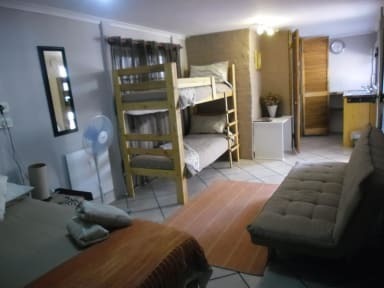 Jembjo's has a range of accommodation to suit all budgets from Dorm beds & std. twin/double rooms to en-suite rooms. 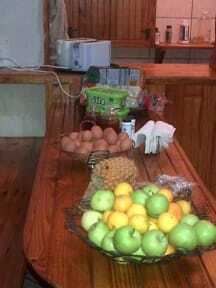 Complimentary breakfasts consisting of eggs, fruits, breads, jams & tea/coffee are available throughout your stay. We offer free Wi-fi, & DSTV. All clients have access to a communal kitchen & 'braai' area & we offer a laundry service & secure parking. We want you to enjoy Knysna, so our activity booking desk is perfect for helping to book a host of activities & trips during your stay with us. So, what are you waiting for - book now & come check us out! Any breakages or wilful damage to our property, will result in a charge for replacement or repairs.